Assistant Prosecutor Susan Schultz made victim Marjorie Fielder’s life a little better on September 20 when Judge Noah Powers sentenced Kenneth Christian to 18-months in prison for bilking the Fielder’s and 2 other victims of over $2000 for repairs he claimed he made to their chimneys. 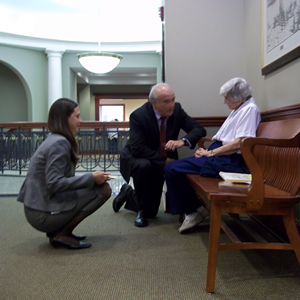 In speaking with the victims, Mr. Gmoser told them he has taken a tough stand on crimes against the elderly, recently bringing together all law enforcement agencies in Butler County to make Butler County a safer place for our elderly. The Crimes Against the Elderly Task Force will investigate and prosecute those who prey on our elderly citizens and try to harm them either physically or financially.